Feather's appear when Angels are near. Welcome to The Outlawz Twisted Thursday challenge and for this week the twist is "show us some water". Ppinkydolls is the sponsor for this month and the image I choose to use is called "raining day". Some news at the bottom. Spellbinders Floral Oval die and burnished the edges with distressed ink color bundled sage. Around the oval die added some Viva pearl pen color soft yellow. Using more of my scraps and some ribbon I got at Hobby Lobby to finish the front. These are paper flowers that I had and added several layers and a gem in the middle. Used Martha Steward punch called branch. These are the copic markers used to color the image. Close up of the image. Added some Glossy accents to make some rain drops and a puddle. Wanting to tell everyone that I'm leaving The Outlawz and Twisted Thursday, been the team leader for 5 1/2 years and time to step back and let someone else take over. We are buying a home, moving, packing and all those wonderful things that go along with moving and getting your house all set up to sell it. So we have a lot to do so I'm taking some time off. Every now and them will stop by and see all my blogging friends. So this is my last posting for awhile. I will miss you but I will be back in the fall/winter sending much happiness to everyone. Hello everyone and this week at The Outlawz Twisted Thursday the twist is to add a button to your project. Our wonderful sponsor for the month of June is PpinkydollsArt . The image I choose to use is called Jungle Friends. I used papers from my scraps and I do have to say that is really getting down, I'm so glad worked hard to get that down. The dies used are from Memory Box Debutante Frame and Debutante branch Frame. The ribbon has some sticky stuff on the back and works really well on paper. Would be nice if I could find some more of that ribbon but have had it so long can not remember were I got it from. These are my buttons, they are clear and glued some card stock to the back of them and added some Scrappers Floss to the centers and made a bow. Here is how the inside turned out. Adding small metal dots around the scalloped inside area and leaving an area open for a sentiment or a written message. Thanks so much for stopping by. I hope you like my card. This is spellbinder scalloped oval die, left the die on the image and burnished around the die with Brilliance ink color sky blue so you would have a small frame. The sentiment is a stamp from Door County stamp store. Used Fun Stampers Journey true fusion black licorice ink to stamp the sentiment and punched it out with a stampin up punch called modern labels. The paper is from Basic Grey stack is called lime rickey. For the top used a EK Edger candles punch and from Taylor Expression party banner border die. Took from my scraps this paper and not thinking grabbed 2 pieces of paper, cut both of them out and them realized I had 2 sheets so I kept them together and let some of the first layer have a dimensional look as you can see some of the banner is not laying down. Used a hand punch with a small heart and punch out some hearts on the banner. Added some green plastic bubbles to the ones I did not punch. Added more of the green plastic bubbles randomly to the front of the card. These are the copic markers used to color the image. I also used copic multiliners colors sky blue and some black for her eyes. I tried adding some freckles to her face with copic multiliner color sepia, if you click on the picture it will get bigger so you can really see them. I also tried some red hair this time. To make her sparkle adding some Wink a Stella color clear to her cloths. So sorry had no time to do the inside to show you, I will finished it before it goes out to anyone. Wanted to share the new challenges with you and if you get a chance stop by and check out the other designers cards, they did an awesome job. Thanks so much for stopping by and have a wonderful week end. Starting The Outlawz Twisted Thursday challenge and the theme for this week is always "anything goes with a twist to add an animal to your card/project" for extra points. Love for you to join us. Stop by and see all the inspiration the design team came up with. The image I choose to use for my card is called "Sweet Bear". Some different views. The paper used to crate this card is from Stella Rose My Mind's eye Hattie papers. Did some distressing with my Zutter machine on the edges for this card. On some of the edges used a corner punch from Carl Carla craft. Some burnishing with distress ink colors broken china and old paper. Added some lace to the front. Both of the sentiment are from Ginger house and she always gives out FREE sentiments, daily. Added a large brad from basic grey, some sequins and placed in the center of the sequins some mini gems that came from nail art kit. Used all the scraps that where left over from the paper on the inside. The paper was two sided. Nice way to use up those scraps. Here is a close up of the image. If you look close I used 2 black hearts and a black tear drop for the bears eyes and nose. That is from the nail art also. Found some kits for only $1.00 and picked them up and they have come in handy several times. These are our up coming challenge for the month of June, we love for you to join us. Gives you some time to make your cards. Thanks so much for stopping by, hope you have a wonderful week end. Scrapy Land has over 40 brands of dies. You can see them all here. Please link your project back to this Scrapy Land Challenge Blog. It would also be extremely helpful if you would list the brands of dies used in your project. For this Bi Weekly challenge you have a chance to win a $15.00 gift card to Scrapy Land, we would love to see your creations. The challenge ends on June 12. All the papers for my card are from my scraps and I tried to find papers that had different textures. I looked for a button that looked like it had some texture to it also. Added some Viva pearl pen color bronze to the front and inside. A closer view of the feathers from Impression Obsession set you get 3 dies. Stamped on of the sentiments from the Taylor Expression set and cut it out with one of the feather dies. A look at the inside of the card. Another one of the sentiment from Taylor Expression set and these 3 feathers come with the set and used Versa Mark embossing ink with copper embossing power. Closer look at the feather. Here are the other 2 feathers. The stamps sentiment with distress ink color peeled paint. You can see all the sentiment that some with the set and you get 2 dies. Taylor Expression Light as a feather TFPS106. 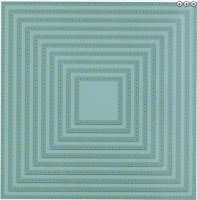 Creative Expression double pierced square. 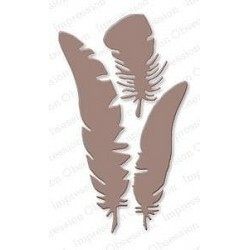 Impression Obsession feather set DIE143.